The thing most people notice about northern New Mexico is the clarity of its sunlight: On most days, the sky is a crystalline blue. The sagebrush, juniper and piñon offer three distinct shades of green, while the mesas have their own variations of sandstone red and volcanic black. But "sunshine" is not a word that comes to mind for most people when they think of Pajarito Plateau. Perched above the Rio Grande Valley, 35 miles from Santa Fe, this tableland mesa is flanked by the Jemez Mountains and sliced by jagged canyons. For 60 years, the plateau has been shrouded in secrecy. In 1943, Pajarito Plateau became home to the nation’s atomic experiment when the Army Corps of Engineers built Los Alamos National Laboratory there. 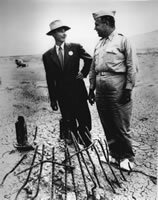 Run by physicist J. Robert Oppenheimer and General Leslie R. Groves, Los Alamos was officially referred to as "The Manhattan Project" or "Project Y," and nicknamed "The Secret City." Atop the plateau, the nation’s top scientists — "prima donnas," Groves called them — toiled in isolation, developing the bomb. For two years, the lab and its mission remained a secret. Employees couldn’t receive mail or leave the mesa without permission. There was one road in, and three government-monitored telephone lines out. Then, on August 6, 1945, President Harry Truman announced that the United States had dropped "Little Boy" on the Japanese city of Hiroshima; three days later, "Fat Man" destroyed Nagasaki. Together, those two bombs woke the world to the atomic age — and twitched back the curtain of secrecy that had hidden Los Alamos. While the public got a glimpse of what was afoot on Pajarito Plateau, security remained tight for almost 50 years, as scientists designed thousands of nuclear weapons in the name of "deterrence" against the Soviet Union. Many things have changed at Los Alamos National Laboratory since its early days. In 1991, the Soviet Union crumbled, and with it, the lab’s longtime Cold War mission. These days, anyone can drive into the town of Los Alamos. There’s a Starbucks and a flashy museum, neither of which require security clearance to enter. The 14,000 scientists, technicians, contractors and lab employees can, to some degree, express their personal politics: A handful of cars around Los Alamos sport "NO WAR" and "No war for oil" bumper stickers, even in restricted areas. After the Cold War ended, Los Alamos had to re-invent itself, shifting its mission from designing and building nuclear weapons to making sure the nation’s aging weapons remain functional. It has also picked up a host of new projects, including mapping everything from the human genome to the ice on Mars, building powerful electromagnets and lasers, and developing "unbreakable" encryption codes. There’s a new Center for Modeling and Simulation, a Nonproliferation and International Security Center, and the formidably named Dual Axis Radiographic Hydrodynamic Test Facility, which holds the world’s most powerful X-ray flash machine — a tool used to study nuclear weapons in the absence of bomb testing. Today, Los Alamos is heating up again, and construction is booming across the plateau. Thanks to a national frenzy over terrorism and "homeland security," and an aggressive new foreign policy, in 2004 Congress will send $1.3 billion to Los Alamos, which is overseen by the U.S. Department of Energy and its National Nuclear Security Administration. All told, the lab’s budget next year will exceed $2 billion — almost twice what it was only four years ago. With all that money, Los Alamos plans to expand both its nuclear and non-nuclear programs. One new project includes the Biosafety Level 3 Facility. Due to open next spring, the facility will store and study infectious microorganisms and toxins that are considered "biological warfare weapons." The lab is still, to some extent, a sovereign nuclear nation. It sits within its own county. Because it is managed by the University of California, it pays no gross-receipts tax. And the lab maintains tight control over its public image. Interviews with scientists are doled out by public-affairs officers, and journalists can expect little more than glowing reviews of the lab’s activities and life in Los Alamos. Some of this security is justified. The lab, after all, guards the secrets behind the most deadly weapons on the planet. But the tradition of secrecy extends well beyond the lab’s nuclear weapons activities. And some of Los Alamos’ neighbors are unhappy with the renewed activity. The state of New Mexico and many of the state’s activist groups are pressuring the lab to clean up its old messes — the Cold War-era "legacy" waste piled across the mesa, dumped into canyons and trickling into the groundwater — and to think twice before pursuing any new projects. Building weapons of mass destruction is difficult — and dirty — work. Although today’s scientists aren’t racing to end a war, they do face 60 years’ worth of waste. Some of that waste is the result of three different types of nuclear reactors. The Clementine Reactor was closed in 1950, the last "water boiler" reactor was deactivated in 1974, and the Omega West Reactor was deactivated in 1992. According to a Centers for Disease Control report, the Clementine Reactor, a mercury-cooled plutonium reactor, was shut down because a plutonium fuel rod ruptured, releasing plutonium into the mercury coolant. In the lab’s early years, scientists eagerly experimented with the new elements they had synthesized — plutonium-239, americium-241, cesium-137 and others — but paid less attention to their disposal. Radioactive wastes, along with hazardous wastes such as acids, metals and solvents, were dumped into pits or canyons, poured into streams and strewn about the lab’s property. In its early years, the lab’s philosophy about its waste seemed to be "out of sight, out of mind." In the former plutonium-processing area along Los Alamos Canyon, for example, waste was stored in flimsy containers. When these were found to have corroded and leaked into the soil, the area was simply "paved over," according to a 1978 lab report. As recently as 1985, lab personnel didn’t even document the waste they dumped, according to another document from the New Mexico Environment Department. In 1981, the lab reported that about 30 million gallons of untreated wastewater, contaminated with radioactive sludge, had been dumped into a tributary of Acid Canyon between 1943 and 1951. Now, a portion of Acid Canyon holds a park, public swimming pool and skateboard park. Two years ago, when the state found plutonium "hot spots" near a popular hiking trail along the canyon, the lab "vacuumed" up about 300 cubic yards of soil at a cost of $1.2 million. It wasn’t until 1990, under orders from the Energy Department, that Los Alamos took formal stock of its problems. The lab reported it had 2,124 contaminated sites across its 27,500 acres, including everything from landfills to high explosives firing ranges. Today, with a staff of about 85 people and an annual budget of $45 million, the lab’s Risk Reduction and Environmental Stewardship program has pared the number of "potential release sites" down to 820. It has done this by cleaning some areas up. But in other cases it has consolidated two or more sites into one, or decided that "others weren’t putting people at risk," says Dave McInroy, the deputy project director for remediation services at Los Alamos. Under its Performance Management Plan for Accelerating Cleanup, the lab plans to move its mixed low-level waste and transuranic waste off-site by 2010, and complete its on-site cleanup by 2015. The lab trucks its transuranic waste to the Waste Isolation Pilot Plant in southern New Mexico, and its mixed low-level waste to a variety of commercial facilities (HCN, 4/12/99: Nuclear waste dump opens). The lab-wide cleanup, estimated to cost $1.6 billion, is done according to a "risk-based approach," which determines how much risk the contamination poses to the public, and compares that to how much risk — and cost — would be involved in removing, transporting and storing the waste elsewhere. For example, McInroy describes a project completed last year. The lab cleaned a site along Canyon de Valles, where high explosives and barium had been dumped for 35 years. He says they had to ask the tough question, "Should you have 2,500 trucks (full of waste) on the road, or leave it where it is? You have to evaluate the risk of moving things." But there’s risk, too, in leaving the waste where it is. "What we have here," says Joni Arends, waste program director for the Santa Fe-based Concerned Citizens for Nuclear Safety, "is a nuclear facility sitting in a wildfire zone above the largest freshwater artery in New Mexico." This danger became frighteningly apparent in the spring of 2000, when the Cerro Grande fire burned about 10,000 acres of lab property and destroyed about 200 structures at the lab. Initially, activists worried about radioactive smoke. But the real problem may be the waste that has washed away from the lab after the fire, toward the Rio Grande and the 10 million people who live along its banks downstream. Water in New Mexico is precious, rare and hotly contested. The state’s largest river, the Rio Grande, has been reduced to little more than a trickle by drought, agriculture and unprecedented urban growth. And the last thing anybody needs is radioactive contamination in what little water is left. While the lab says it will take about 10,000 years for contamination to move from Los Alamos, down its canyons and into the Rio Grande, officials with the state — including Dennis McQuillan, New Mexico’s liquid waste manager — disagree. McQuillan’s studies, which are based on the lab’s own maps and on acknowledged levels of contamination on the lab’s property, show that water from the lab is moving at a rate of 358 feet per year. Any contamination in that groundwater, he says, will be moving east, as well. Recently, the state has publicized a number of problems stemming from the lab: In January, the New Mexico Environment Department announced that runoff from the lab contained the highest levels of plutonium-239 ever recorded — thanks in part to high erosion levels in the aftermath of the Cerro Grande fire. Then, in February, the state found uranium, tritium and nitrate in a spring that seeps into the Rio Grande. In March, perchlorate, a chemical used to process nuclear materials, was detected in drinking water at the lab — water from the same aquifer that supplies the towns of White Rock and Los Alamos. The Environmental Protection Agency has yet to recommend safe standards for perchlorate in drinking water, but scientists have found that human fetuses exposed to perchlorate can suffer impaired brain and thyroid development (HCN, 11/10/03: State picks up federal slack on perchlorate). 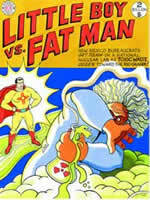 In November, Concerned Citizens for Nuclear Safety released a report showing that cesium-137 has reached the Rio Grande. Certain types of contamination have not only reached the river, says Arends, but are poised to move from the Rio Grande toward the Buckman Wells, which supply Santa Fe’s drinking water. McQuillan agrees. As Santa Fe grows, he explains, it is drawing down its wells so quickly that the ground surface has begun to subside; and the wells are sucking water from the Rio Grande. Contamination from the lab, he says, is now at the "back door of Buckman." Both McQuillan and Arends acknowledge that the levels of contamination are still below the federal Environmental Protection Agency’s exposure goals. And if contamination does reach the wells, the city could treat the water, or turn off those wells. But the point, says McQuillan, is that the contamination is moving away from the lab and into the region’s groundwater. And in an arid state like New Mexico, that could spell disaster. More than 90 percent of the state’s residents rely on groundwater for their drinking water. In cities like Albuquerque and Española, that number is closer to 100 percent. "In Albuquerque, there are plumes (of contamination in the groundwater from private businesses) that haven’t reached the tap water yet," says McQuillan. "But we still require cleanup." At Los Alamos, he says, the "exposure pathway" has been completed — that is, contamination has moved from the lab into surface springs, and into the groundwater. But when it comes to policing Los Alamos, the state has limited power. Although lab officials stand by their dedication to cleanup, critics say Los Alamos officials have not been entirely aboveboard. One of the lab’s most outspoken critics is New Mexico Environment Department Secretary Ron Curry, whose job it is to hold the lab and other polluters accountable to the citizens of New Mexico. Appointed by Gov. Bill Richardson in January 2003, Curry is a New Mexico native with historic ties to the lab; his father-in-law worked on the Manhattan Project, and Curry himself worked on a site-wide environmental study of the lab in the 1990s. Curry knows his job isn’t going to be easy: He has a $50 million annual budget for the entire state and a staff of 650. And he has no real authority to regulate the lab’s radioactive waste. Under the Atomic Energy Act of 1954, only the Energy Department can regulate nuclear "source materials," such as uranium, "special nuclear material," such as plutonium, or "byproduct material," including tailings and other radioactive wastes. "It’s a David-vs.-Goliath situation," says Curry, sitting in his office in Santa Fe, only an hour’s drive from Los Alamos. And Curry must tread carefully: In 1998, the Department of Energy (DOE) claimed it benefitted New Mexico to the tune of $10.24 billion. Although some question that figure — a professor of economics at the University of Texas recently put the amount closer to $4 billion to $6 billion per year — it’s undeniable that the agency pumps a lot of money into the state. "New Mexico is very important to DOE, and DOE is very important to New Mexico," Curry admits. But a decreasing percentage of the lab’s fat budget is going toward cleanup. In 1999, about 4 percent of the budget went toward "environmental quality"; by 2003, that number fell to 2 percent. And a surprisingly small amount of that money has gone toward actual cleanup. A 1997 Energy Department Inspector General report found that, between 1991 and 1996, the lab spent $386 million on environmental restoration. Almost 80 percent of that was spent on "assessment and program management" — or paperwork. Only 21 percent was actually used for "remediation and decommissioning activities." Frustrated with the slow rate of cleanup, in 2002, Pete Maggiore, Curry’s Republican predecessor at the Environment Department, issued a "corrective action order" against the Energy Department and the University of California. Stating that Los Alamos may pose an "imminent and substantial endangerment to public health," the order requires the lab to reduce the risk to human health to a rate of one potential fatal cancer out of a population of 100,000. The order — based on studies by the lab, the Energy Department, the Environmental Protection Agency, and the state — describes each of the lab’s 49 "technical areas." It explains when the area was used, what types of chemicals or toxins were used or stored on it, what kind of accidents or spills have occurred there, and what type of contamination is now in the soil, water or air. Much of the 293-page order reads like science fiction, with sentences like: "TA-1 and TA-3 housed Van de Graaff accelerators, a cylcotron, a betatron, the Cockroft-Walton and the Short Tank accelerators." The order then outlines the steps the lab must take toward cleanup. The requirements range from groundwater studies to historical investigations of what was dumped, and from mapping the area’s faults and fissures to tracking every trickle of water from the lab to its canyons and into the aquifer. The state lays down deadlines, as well, requiring the lab to submit more than 100 reports between 2002 and 2011. And, contrary to the lab’s own proposals, the state wants everything clean enough that people could live there again some day. The state claims the order is legally enforceable under the federal Resource Conservation and Recovery Act and the state’s Hazardous Waste Regulations. If the lab doesn’t get moving on the cleanup, the state can take the Energy Department to court or can deny the lab’s waste permits. Not surprisingly, Los Alamos has bristled at the state’s mandate for clean-up. "The state spent two years writing the order, and they didn’t bother to tell us about it," says the lab’s Dave McInroy. "If we had known they were working on an order, we could have helped them." Instead, the state "blindsided" the lab, he says. He believes that by focusing its energy on writing the order, rather than reviewing the lab’s reports in a timely matter, the state has actually slowed cleanup. At his office in Los Alamos, McInroy is joined by the lab’s spokesman, Jim Danneskiold, a former journalist, who carefully guides the conversation. When McInroy is asked why the lab opposes the state’s order, Danneskiold says, "Our official position has been released." McInroy smoothes Danneskiold’s rough edges: "We recognize that the state is in a difficult position," he says. "Their feet are held to the fire by special interest groups, and they don’t have the resources to keep up with us." But he’s firm in his opposition to the order. "The order is very prescriptive. And that prescriptiveness is an issue for us." Instead, Los Alamos wants to complete cleanup on its own terms. Saying the lab has "demonstrated itself as a good steward of natural and cultural resources," the Energy Department and the University of California have filed six lawsuits in state and federal court, trying to overturn the state’s order. With the lawsuits still pending, the Energy Department has decided to negotiate with the state over the timelines for investigation and cleanup. So far, the state has issued five stays, with the final one set to expire at the end of 2003. If the two parties reach an agreement, the lawsuits may be dropped. In the meantime, with little money or authority on his side, Curry has taken his message to the public. Curry explains that the lab still remains a "closed culture" that resists oversight. "Media attention is not received well by the lab," he says. "The more sunshine we can shine on problems, the better it is for the state." 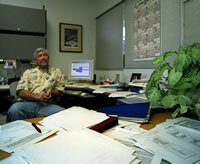 Since January 2003, his office has churned out press releases and gone after the lab with a vengeance. Goldstein, Curry’s communications director and a former reporter with Time magazine and The Baltimore Sun, sends out press releases and works the phones. He’s not shy about calling journalists at local and national newspapers and alerting them to hot stories. In at least one case, this go-public approach has worked in the state’s favor. In September 2002, when then-Secretary Maggiore nominated 181 of the state’s waterways for the Environmental Protection Agency’s list of "impaired waterways," he included seven of the nine major canyons that drain from Pajarito Plateau into the Rio Grande. Once a waterway makes the list, the federal Clean Water Act requires that it be cleaned up. But by the time Curry took office, the EPA still hadn’t responded. "The DOE held up the whole process by fighting to keep their seven off the list," says Curry. In April, his office splashed news of the Energy Department’s "meddling" across the local media, faxing out copies of a letter from the lab’s water quality and hydrology group opposing the listing. In June, the EPA approved the list, and the state now has some firepower to force the lab to clean up the non-radioactive contamination in those canyons. "We’re not trying to point fingers," says Curry. "We’re just looking for a little transparency." Curry is confident his boss will be a powerful ally in the state’s struggle with the lab: New Mexico Gov. Bill Richardson was secretary of the U.S. Department of Energy under President Clinton. Richardson "not only knows what he’s doing with DOE and knows people (at the lab), he has put people in power there," says Curry. Within the last year, news from Pajarito Plateau has made its way into The New York Times, The Washington Post and the Los Angeles Times. But the hot stories weren’t about rusty barrels of waste leaking into canyons, tainted tap water, or even the state’s attempts to hold a national lab accountable to the citizens of one of the poorest states in the country. What made national headlines was the discovery that employees had used lab credit cards to make hundreds of thousands of dollars’ worth of personal purchases. Last November, two former lab employees told the media they had been fired when they tried to speak out about the fraudulent spending practices. Congressional hearings followed, as well as an investigation by the Department of Energy’s Inspector General into "deliberate cover-up of security breaches and illegal activities" at Los Alamos. After its two-month investigation, the Inspector General released a report concluding that actions by lab officials "created an atmosphere in which Los Alamos employees were discouraged from, or had reason to believe they were discouraged from, raising concerns to appropriate authorities." The publicity that followed led to high-level administrative upheaval at the lab and spurred Energy Secretary Spencer Abraham to put Los Alamos’ management contract out to bid when it expires in September 2005. Now, the University of California, which has exclusively held that contract since 1943, could be bumped out by another university or by a private corporation such as Lockheed Martin, which manages Sandia National Laboratories in Albuquerque, or Halliburton Co., which already does about $150 million of work at Los Alamos each year. Whether Ron Curry can hold his ground against the lab is anyone’s guess. If current trends continue, and Congress keeps sending money to Los Alamos, it’s unlikely the lab will curb its use of dangerous chemicals and metals. And with the Biosafety Level 3 facility set to open next spring, the lab’s neighbors may have more to worry about than just plutonium, perchlorate and uranium. According to Jay Coghlan, director of Nuclear Watch of New Mexico, they may also have to consider what would happen if anthrax, botulism and plague bacteria escape. But for some New Mexicans, at least, the lab brings up larger questions about the nation’s commitment to a nuclear weapons program. All told, the United States has spent about $6 trillion designing and building nuclear weapons, and the money continues to roll in. For Greg Mello, director of the Los Alamos Study Group, environmental contamination in New Mexico is small potatoes compared to the destructive capability of just one of the lab’s nuclear weapons. Pollution is a problem, he says, but the hazards are diluted by the sheer size of the landscape. Barring an accident, he says, the real problem Los Alamos poses is one of morality. "Los Alamos is like a lamp illuminating (the edge of) a cliff in the darkness," he says; lessons learned at the lab offer people an opportunity to turn away from nuclear weapons and the bleak future they offer, and toward a safer definition of "national security." "Like Bertrand Russell and Albert Einstein (wrote) in 1955, ‘We must remember our humanity and forget the rest,’ " says Mello. "Los Alamos is dedicated to forgetting our humanity." The author is an assistant editor at High Country News. This stories were funded by a grant from the McCune Charitable Foundation, based in Santa Fe, New Mexico.